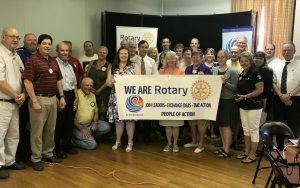 The District Governor of 7810 Silvana Bosca visited the Houlton Rotary Club on July 16, 2018. Bosca presented her banner with the theme of “people of action” and complemented the club on their work over 98 years. Bosca recommended that the club think now about its one hundredth celebration. She also spoke about Rotary International President Barry’s message to “Be the Inspiration”. Most people who work at service above self are inspired by someone or by an event. Bosca essentially gave the club a “pep talk” to continue to do their good work and to be grateful for what each member does and to honor the work of Rotary. Bosca is to the right of the banner in white capris and a black shirt with Rotary emblems attached and appliquéd.